Warm, cozy rooms don't just happen. They're planned. Coordinated to avoid ane obvious matchy matchy palette. How? Start with a color palette generated from favorite items (as well as fixed) in a given room. 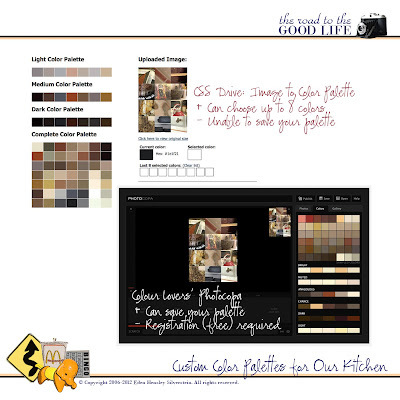 Here's a sneak peek at the palette for our kitchen. Take photos of all the items you want considered in your color palette, filling the frame with as much of the color as possible. Be sure you photograph each item in the same lighting conditions. Flash, sunlight, tungsten light, and florescent light impart different color casts and can skew your end result. NOTE: Photographs do not have to be in focus. Optionally, set true black, true white, and adjust the midtones. Create one JPG file containing all of your photos. If you use Mosaic Maker from Big Huge Labs, chose a total number of photos that divides evenly into rows and columns. I selected twelve for my mosaic. Also set Space between images to 0 pixels unless you want the background color considered in your palette. Using the JPG file you created, generate your color palette with either CSS Drive: Image to Color Palette Generator or ColourLovers' Photocopa (free registration required). Both CSS Drive and ColourLovers display the complete color palette in addition to light and dark options and provide the ability for you to create a custom palette by selecting individual colors (up to six). Optionally, using the complete color palette, create a different 6 or 8-color palette. 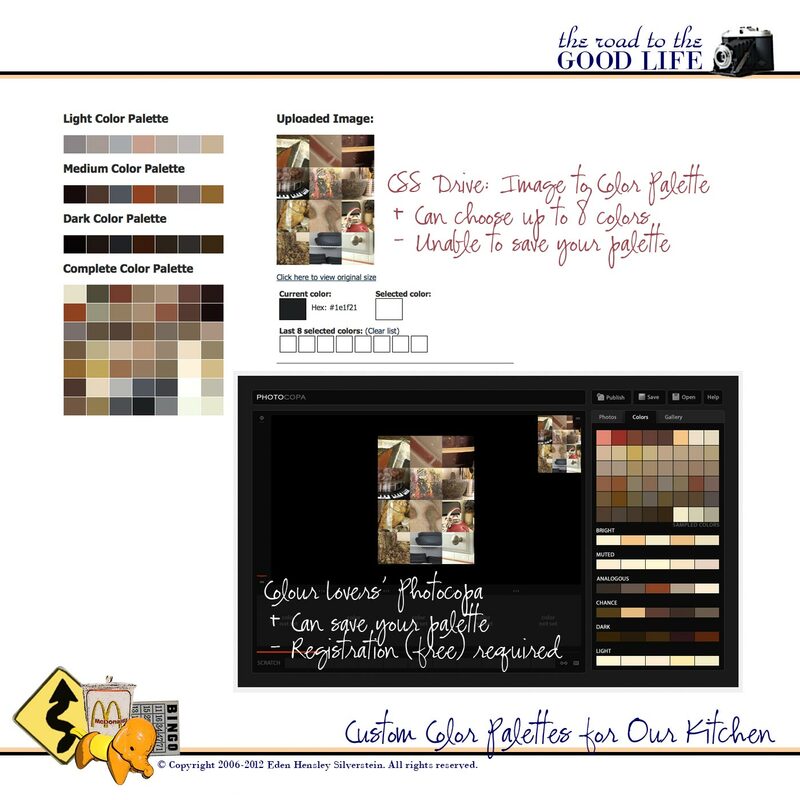 The medium color palette is close to what I want for our kitchen, so I'll select the colors from I want to keep and add others from the complete color palette. You might wonder why am I going to so much trouble for a kitchen. The answer is simple. I didn't find any table runners or tablecloths that 1) fit our table that's arriving today or 2) coordinated with our kitchen towels. As I want a kitchen table where we'll be happy to spend time, I want a warm and inviting print. I'll share the final color palette I chose for the kitchen when I talk about designing your own fabric with Spoonflower and Fabric on Demand. How do you plan a room?